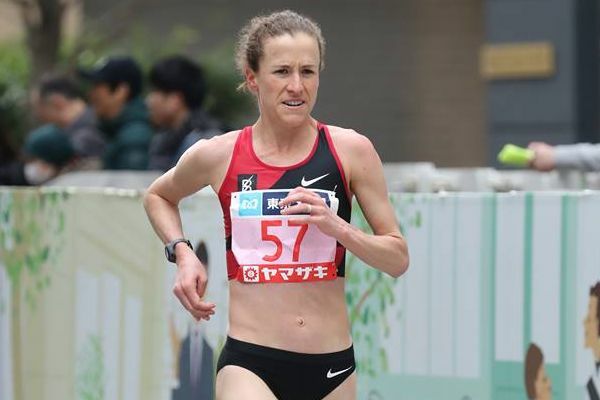 Amy Cragg turned in a stunning performance at the Tokyo Marathon on Sunday morning, finishing third in a huge lifetime best of 2:21:42, taking more than five minutes off her previous best of 2:27:03. That moved her to number five on the all-time US list, and left her just 23 seconds behind runner-up Ruti Aga. The race was won by Ethiopia’s Birhane Dibaba in 2:19:51. Cragg had run with the leading women up until 30K, at which point she was still on 2:20 pace, and though she couldn’t match Dibaba in the closing miles, she showed immense resolve to fight to the finish in third, rewarded with a place among the greats of American marathoning. Congratulations to Amy Cragg, Kimbia, and the BTC Crew. Amy is the genuine article, and a delightful person. I am aware of how hard she has worked and this accomplishment is an indication of the quality of coaching , training, and support she has received. This has to be a rewarding outcome for a lot of hard work. Glad to know you Amy.